Hello all. I've recently joint your ranks. 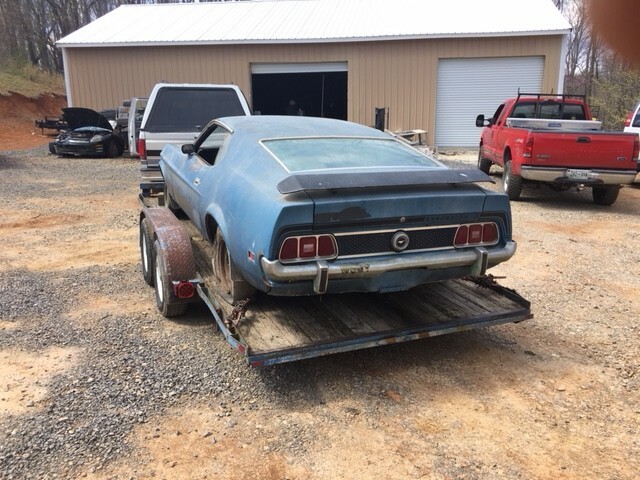 I have had countless Fords of all shapes and sizes, including a few Mustang II and newer V8 mustangs, but never a "classic" mustang (64.5-73) While me and the rest of the world would love to have that early fastback, they can't be touched; at least not with my budget. 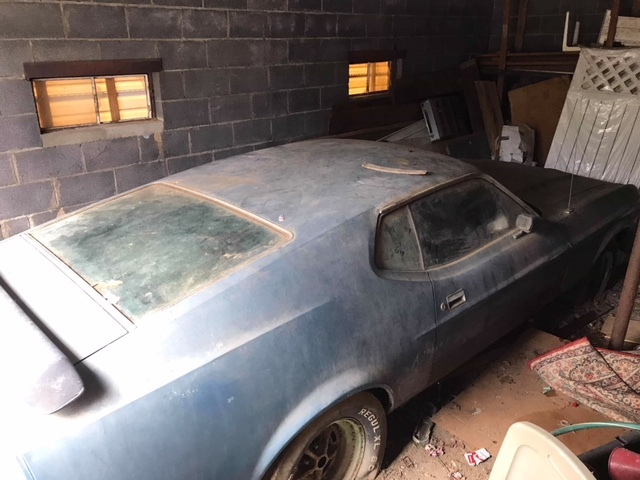 haha I have seen pics of a red and black 73 my dad had and ended up selling a few months before I was born in the early 80s. 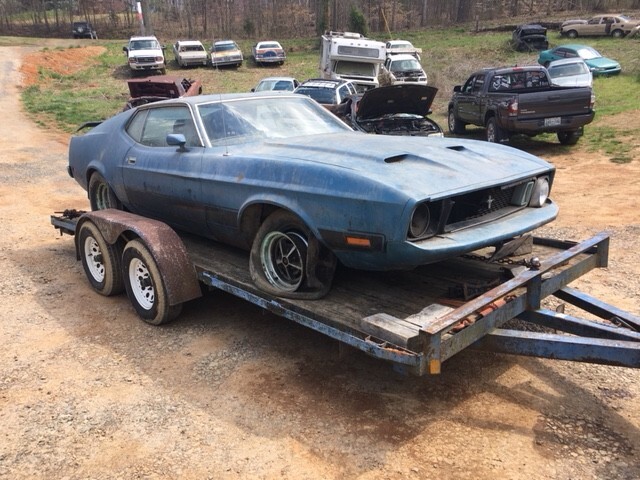 I figured since I can't have an early fastback, I'd love to have a "big bodied" Mach 1. Long story short, I finally acquired one. 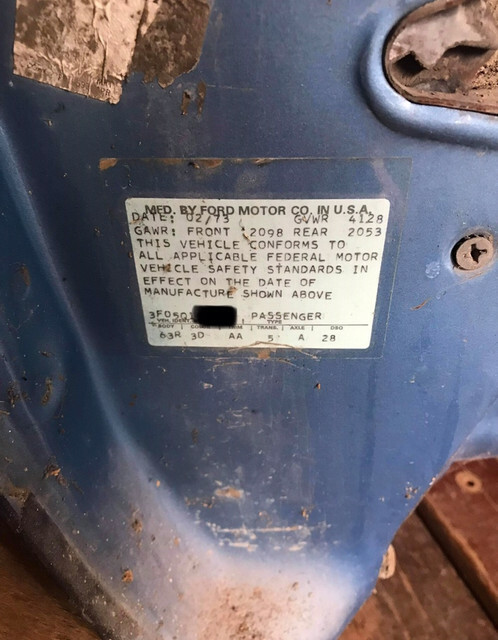 I picked up a 1973 Mach 1 Q code with a 4 speed. It's even blue with black trim and interior: my favorite. I'm the 3rd owner. 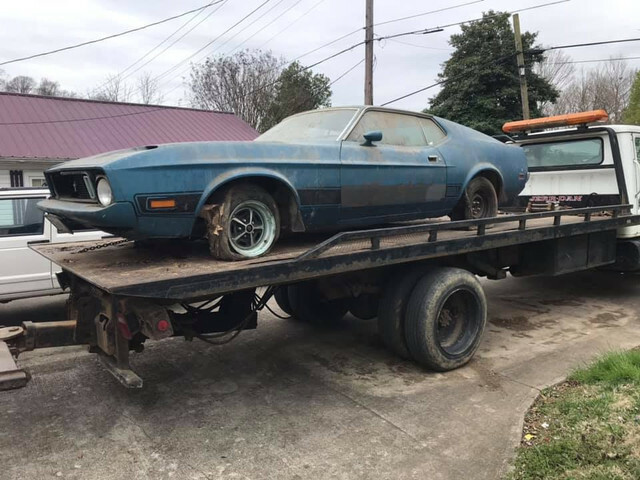 The previous owner bought it in 1976 and only drove it for 4 years. The clutch went out in 1980. 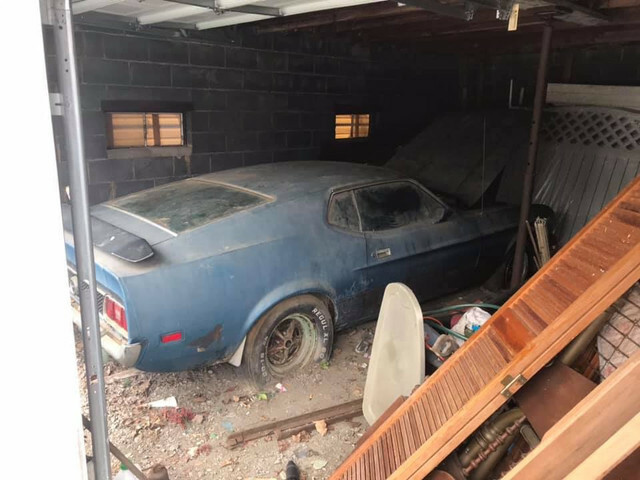 It was parked in the garage and forgotten; for almost 40 years. Of course the tires are all flat, but all 4 did roll up onto the rollback. The motor will turn by hand, so its not stuck. Its all original and unmolested. Since it was inside a garage and not out in the weather, most of the things that are usually rotten on these cars is surprisingly solid. The floors, trunk area, torque boxes, frame rails, cowl area, etc are all very solid. nothing more than a bit of surface rust on any of those. The only real rust to speak of is about a fist sized hole behind the right rear wheel. I'm working on getting the title transferred over right now. Once I get it in my name I'll feel a little better about spending money on it. It's currently still on my trailer backed into my garage. Turns out the title from 1976 is so old it has been "purged" from the electronic records. We are working to get everything back in the registration system so I can get it in my name. I'm in contact with the previous owner and he is willing to do whatever is necessary to get it squared away. As soon as I get it in my name, I'm going to order a full marti report on her. I'm looking forward to the project and I'll be asking you veterans lots of questions I'm sure. I"m going to try to add a few pics to the post if it will let me. Thanks for letting me join! Cool car. Welcome from Iowa. Welcome... nice find looks solid. Welcome !! You will be fine with that car - will probably "clean" up pretty easily AND it doesn't look like it needs to BE PAINTED first ! My guess is it will respond to buffing pretty well -that will allow you to concentrate on the fluids and get running for a further assessment. Welcome from the UK. Great find. Looking forward to seeing it come back to life. Excellent find. With the 4 speed and the A- code 3.50:1 Trac-loc rear axle, you should have 31 spline axles, the 1330 u-joints and possibly an N-case rear end. It's about the best of the best in '73. Hello and Welcome from Michigan. Very cool find! Very nice find and seems like it has the good stuff.